Hah! The cherry thieves have not managed to rob me blind. There are only a few truly ripe cherries so far. The birds have taken a few. That’s OK. I don’t mind sharing some. I just don’t want to share all. Because that wouldn’t be sharing, would it? This is the sum total of my harvest so far. I’m being optimistic. There will be more! The champagne flute was my mother’s. I rarely have an occasion to use Mama’s crystal or china or silver or any of that stuff. I’ve decided I will use it when there isn’t an occasion. Such things are made to be used and not just stuck away to be look at now and again. Right? And I will use the antique tea cups I inherited from Grandma and her sisters, The Aunts. I will eat Ben & Jerry’s with a sterling sliver spoon from an antique china bowl. And, damn it, I’ll drink whiskey from the tiny, hand-blown stemmed glass (the family calls it a wine glass but it will hold only a shot) that was used at one of my multi-great ancestor’s wedding in 1860 or so. 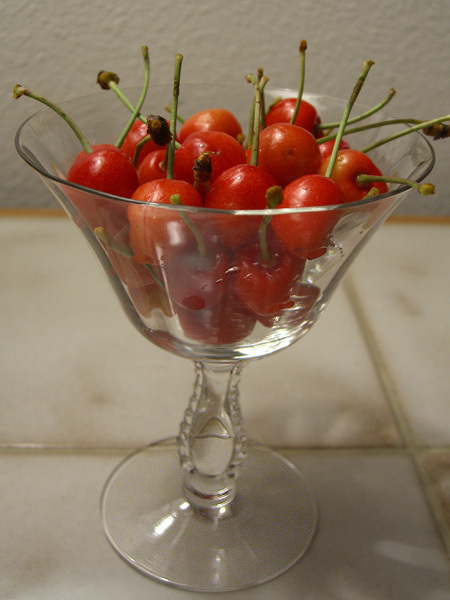 And I will serve cherries in Mama’s champagne flute. Yes I will. Blogging may be sporadic for the next few weeks. Large project. Tight deadline. Much to do.